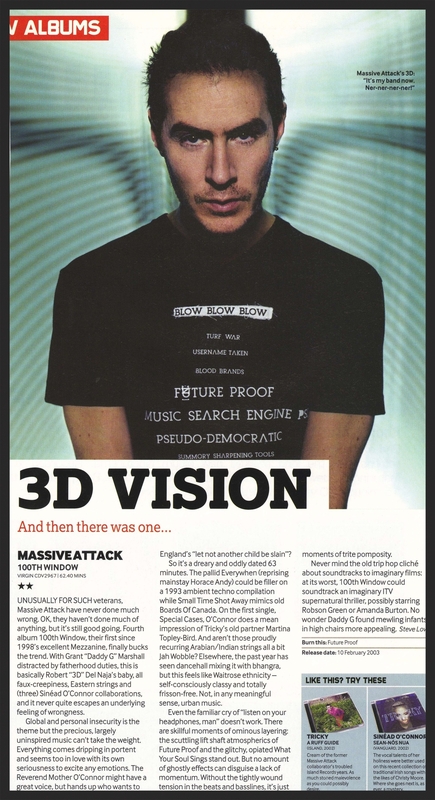 Unusually for such veterans, Massive Attack have never done much wrong. OK, they haven’t done much of anything, but it’s still good going. Fourth album 100th Window, their first since 1998’s excellent Mezzanine, finally bucks the trend. With Grant “Daddy G” Marshall distracted by fatherhood duties, this is basically Robert “3D” Del Naja’s baby, all faux-creepiness, Eastern strings and (three) Sinead O’Connor collaborations, and it never quite escapes an underlying feeling of wrongness. England’s “let not another child be slain”? So it’s a dreary and oddly dated 63 minutes. The pallid Everywhen (reprising mainstay Horace Andy) could be filler on a 1993 ambient techno compilation while Small Time Shot Away mimics old Boards Of Canada. On the first single, Special Cases, O’Connor does a mean impression of Tricky’s old partner Martina Topley-Bird. And aren’t those proudly recurring Arabian/Indian strings all a bit Jah Wobble? Elsewhere, the past year has seen dancehall mixing it with bhangra, but this feels like Waitrose ethnicity -self-consciously classy and totally frisson-free. Not, in any meaningful sense, urban music. Even the familiar cry of “listen on your headphones, man” doesn’t work. There are skillful moments of ominous layering: the scuttling lift shaft atmospherics of Future Proof and the glitchy, opiated What Your Soul Sings stand out. But no amount of ghostly effects can disguise a lack of momentum. Without the tightly wound tension in the beats and basslines, it’s just so much glossy gloom interspersed with moments of trite pomposity. Never mind the old trip hop cliche about soundtracks to imaginary films: at its worst, 100th Window could soundtrack an imaginary ITV supernatural thriller, possibly starring Robson Green or Amanda Burton. No wonder Daddy G found mewling infants in high chairs more appealing.